Introduction: Laparoscopic nephron sparing surgery (L-NSS) has gained increasing acceptance with emerging data demonstrating equivalence of oncologic outcomes with open NSS. Concerns continue regarding prolonged warm ischemic times and longer-term renal functional outcomes. 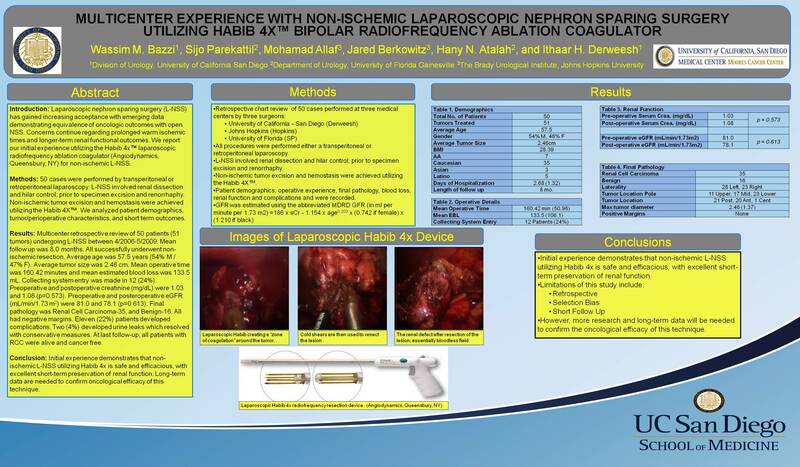 We report our initial experience utilizing the Habib 4x™ laparoscopic radiofrequency ablation coagulator (Angiodynamics, Queensbury, NY) for non-ischemic L-NSS. Methods: 50 cases were performed by transperitoneal or retroperitoneal laparoscopy. L-NSS involved renal dissection and hilar control; prior to specimen excision and renorrhaphy. Non-ischemic tumor excision and hemostasis were achieved utilizing the Habib 4X. We analyzed patient demographics, tumor/perioperative characteristics, and short term outcomes. Results: Multicenter retrospective review of 50 patients (51 tumors) undergoing L-NSS between 4/2006-5/2009. Mean follow up was 8.0 months. All successfully underwent non-ischemic resection. Average age was 57.5 years (54% M/47% F). Average tumor size was 2.46 cm. Mean operative time was 160.42 minutes and mean estimated blood loss was 133.5 mL. Collecting system entry was made in 12 (24%). Preoperative and postoperative creatinine (mg/dL) were 1.03 and 1.08 (p=0.573). Preoperative and posteroperative eGFR (mL/min/1.73 m2) were 81.0 and 78.1 (p=0.613). Final pathology was Renal Cell Carcinoma-35, and benign-16. All had negative margins. Eleven (22%) patients developed complications. Two (4%) developed urine leaks which resolved with conservative measures. At last follow-up, all patients with RCC were alive and cancer free. Conclusion: Initial experience demonstrates that non-ischemic L-NSS utilizing Habib 4x is safe and efficacious, with excellent short-term preservation of renal function. Long-term data are needed to confirm oncological efficacy of this technique.